A classroom teacher discovers her love of criminal justice and finds her perfect job. At 18, I still had no idea what I wanted to do with my life. A full-ride academic scholarship convinced me to go to college anyway, if only by default. I majored in education and taught school for seven years, but my heart was never in it. And then, I discovered something I did love: criminal justice. I got a master’s degree in criminal justice, transitioned out of teaching, and somehow convinced my local police chief to create a crime analyst position and hire me to fill it. Meanwhile, I adopted a son and hired a PI to find his birth father. That experience was a lightning bolt of inspiration: Here was another possible future for me, one that would offer me, a new parent, more control over my workdays, and an exciting new way to use the skills I’d learned as a crime analyst. I started dreaming of becoming a private investigator. But dreaming was only the beginning. I researched Missouri’s requirements for private investigators, met with a local PI and asked him loads of questions, then started knocking out a “PI to do list” I had created. My first step was to become licensed. Meanwhile, I immersed myself in private investigator books, articles, and blogs, taking lots of notes along the way. I discovered who’s who among the most respected and well-known private investigators out there. I read their books, followed them on social media, took their classes, and started gaining momentum—with my goal of opening my own PI business. I took the advice I found and carved out a niche for myself: social media and open source investigations. The more I learned about the PI business, the more I felt it was perfect for me. My husband and I sat down with our finances and saw that it was feasible for me to quit my job and focus on researching, planning, and building my business. So I took a big gulp and went for it. Running a business is a separate skill. In the beginning, I thought it might take a few months to get up and running. I soon discovered that it was going to take me much longer. Still, I plugged along, knowing that this first year of planning was probably going to be the most important. Somewhere amid all that planning, I found myself transitioning from “private investigator” to “small business owner.” I learned that if you’re going to start your own business, there’s just as much work to be done on the business side of things as there is on the private investigations side. It’s a grand and enticing thought to be your own boss, make your own schedule, and work from home. There’s no comparison to the flexibility it affords. But the reality is that it takes total focus, determination, patience, drive, and so much time. Thankfully, I’m a self-driven person who thrives on working hard and does well with setting incremental goals for myself. As a crime analyst, I basically had to create my own work as I went. So the transition from working for local government to working for myself has actually not been much of a stretch for me. There are things, however, that have been difficult. Here’s what I’ve learned so far about getting started in this business, advice that I hope will help anyone who’s thinking of becoming a PI. Rely on yourself, but don’t try to be an expert in everything. I’ve learned that if I have a question about something, I have to find the answer myself. I can’t just walk into my supervisor’s office and get advice anymore. I have to figure out where to go to get the right answer, not just where to go to find an answer. I’ve also learned that although I’m responsible for every aspect of my business, I can’t know everything. Sometimes, I’ve got to lean on others and their abilities. For example, after spending many hours creating a contract template for my future clients, I made the decision to hire an attorney to draw up a contract for me. My efforts weren’t good enough for the product I wanted. I needed something that would hold up in court and be legally binding. Another stretch has been learning the ins and outs of running a business and developing my business sense. I don’t enjoy maintaining my business license or filling out paperwork for the Secretary of State. I don’t like having to hire my tax preparation out to a CPA for the first time in 15 years. These aren’t my favorite aspects of my business, but I have learned a lot, become more well-rounded, and gained a confidence in myself that I didn’t have before. Before I started my own business, I had no marketing experience or knowledge. I quickly realized that if no one knows about your business, they cannot hire you. No product or service truly “sells itself.” We small business owners have to do that, no matter how much we may shy away from self-promotion. 1. Create a professional-looking website. If you can create a website yourself, go for it. But know your limitations and weigh the money factor against the time factor. You want a good website that will drive traffic to your business and impress people who don’t know you yet. It should not look like something your uncle put-together in 1998. On the days when I post blog content, the traffic on my website has consistently tripled or quadrupled. I also find that writing a weekly blog post helps me organize my thoughts, create ideas for my business, and start conversations with other private investigators I respect. 3. Connect with other private investigators. We all need a group of private investigators we can turn to for advice, support, and assistance with cases. It sounds silly, but market yourself to other private investigators. We work best when we work together. 4. Find creative ways to put your name in front of attorneys. This is one I’m working on right now. I have a friend who happens to be a business and estate planning attorney. He’s given me some great advice on unorthodox ways to reach attorneys. They are often our best clients. 5. Read marketing books and take marketing classes. Everything I read gives me a new idea to try. Additionally, get advice from family and friends who have marketing knowledge. As I develop as a private investigator, I continue to learn from industry leaders through their books, blogs, webinars, articles, and training sessions. I have joined professional groups and associations and will continue to attend conferences where I make valuable connections and learn more about my profession. Periodic phone calls with my mentor will likely remain my lifeblood for quite some time. (I met my mentor at a conference, struck up conversation, and exchanged phone numbers with him. He became my unofficial mentor before he even realized it). I will not stop learning. Private investigations is always changing. I am determined to change with it. 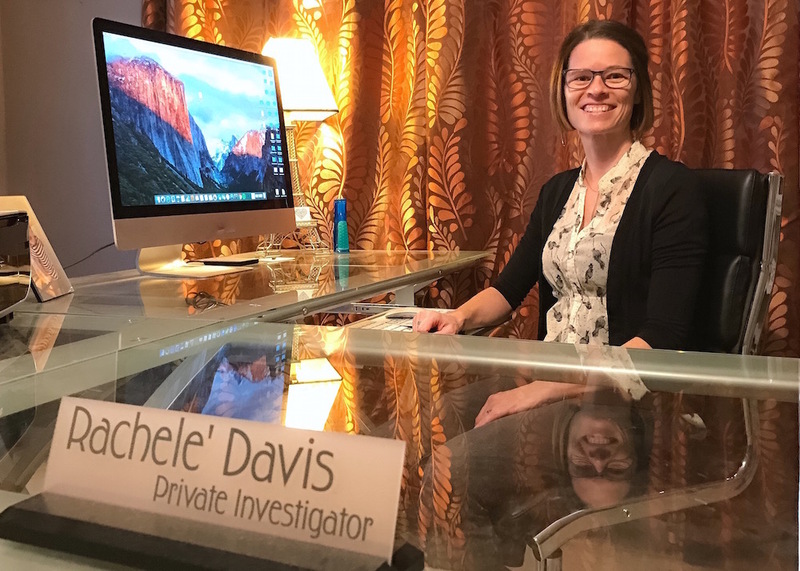 In 2016, Rachele’ Davis became a licensed PI in Missouri and Kansas. That same year, she launched New Hope Investigations, a one-woman agency specializing in open-source and social media investigations, and with a personal interest in adoption and people searches.